Almost 80% of dicotyledonous species can be propagated by the simple method of rooted cuttings, if the cutting are treated with a rooting hormone and kept under conditions of high atmospheric,,humidity. A low cost high humidity chamber, costing just Rs. 200 per m2, and the protocols for hormonal treatment, hardening and transplanting, were developed. Use of black plastic mulch increases survival percentage and vigour of seedlings grown on raised beds. 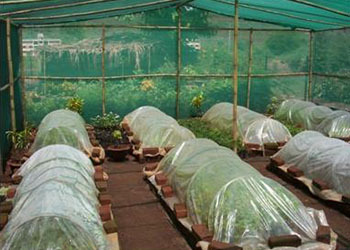 Surrounding the beds with a skirting of plastic film also increases rate of growth of the seedlings. Methods have been developed to modulate plant growth by using red and far red light. Use of root trainers produces better root system than use of plastic bags. Seedlings and saplings grown in root trainers grow twice as fast after transplanting as those grown in a plastic bag.